Eastern hemlock trees were used by early settlers to build log cabins and as a source of tannic acid (for tanning leather). The eastern hemlock (also called Canada hemlock or hemlock spruce) was pronounced the most picturesque and beautiful of the world's evergreens by A. J. Downing, "the father of landscape gardening in America." 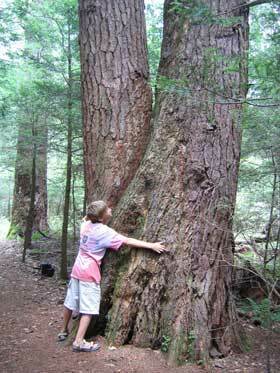 The eastern hemlock is a prevalent tree in Pennsylvania forests. A slow-growing, long-lived tree which can take 250 - 300 years to reach maturity and may live for 800 years or more. 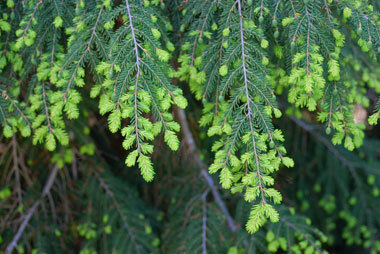 The thick foliage of hemlock trees shelter birds and other animals. Hemlock trees also help cool the forest in summer and block snowfall from the forest floor in winter, making it easier for animals to navigate in harsh winters. Virgin timber eastern hemlock trees (Tsuga canadensis) at Cathedral State Park (largest virgin timber tract remaining in West Virginia); photo by Rich McGervey on Flickr (noncommercial use permitted with attribution / share alike).